DK Realty Partners, LLC, is a firm of nationally-recognized commercial real estate professionals specializing in Negotiated Sales, Sealed Bid Sales and Auction Sales; Buyer Representation; Tenant Representation; Leasing; Property and Asset Management; and Real Estate Consultation. Would your values be maximized if your property were sold today? Are you tired of managing your own properties? Do you like your existing property management? Does your lease expire within the next 24 months? Is your current office space meeting your needs? How does your rental income compare to similar properties in the area? Have your real estate taxes been reviewed for possible assessment reduction? How can you attract more tenants to your building? Are your rental rates competitive in today’s market? Are you looking for property to satisfy a tax deferred real estate exchange (1031)? Are you convinced you have the needed access to acquire your next real estate investment? Would you like to pick the day your property sells? Would you like to get the highest price possible for your desirable property? How do you set an asking price on your unusual property? How will you set a minimum acceptable price without tipping your hand to the market and suppressing competition? The Featured Property is updated weekly, please check back often. DK Realty Partners closes on the sale of a bank-owned property. A 12,000 SF Office Building, located in Des Plaines, IL. DK Realty Partners closes on lease deal with State Farm. The space is a 990 sq.ft. retail space in the heart of the Clybourn Corridor of Chicago. 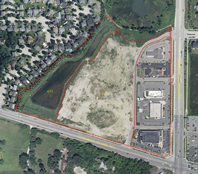 DK Realty Partners closes on Vacant Bank Owned Restaurant in Skokie, IL. The vacant one-story, 1,400+/- square foot fast food restaurant sold for $355,000. DK Realty on Twitter and Facebook. Follow us on Twitter. Like us on Facebook. DK Realty Partners named on Crain’s Chicago Dealmaker Directory. Click here to view the list. David Kaufman launchs new real estate blog. He invites you to gain some insight into the current real estate market and/or share your thoughts with him. David shares his knowledge from more than 30 years in the business by fielding questions and stimulating input from others. Click here to view David's blog.